Want to achieve beautiful smooth blowouts, at home? 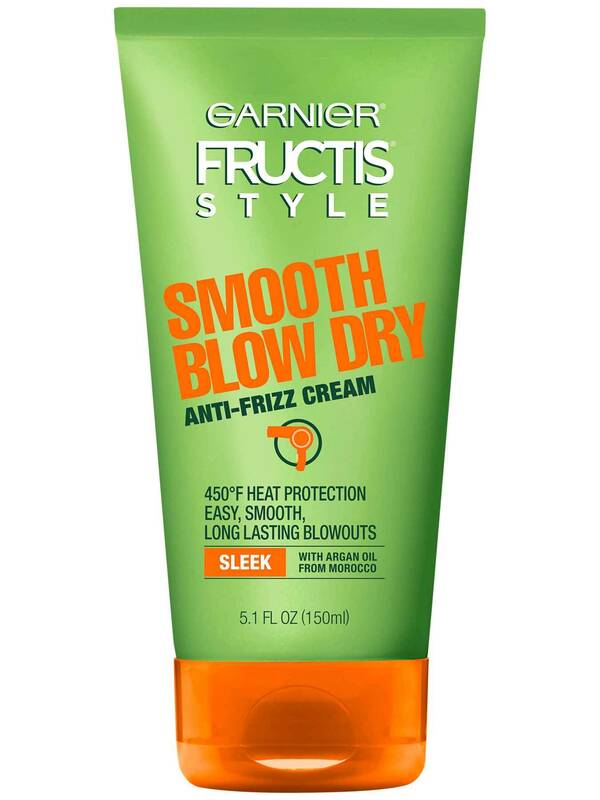 Smooth Blow Dry Anti-Frizz Cream helps you master your blowouts: easy, smooth and long-lasting. 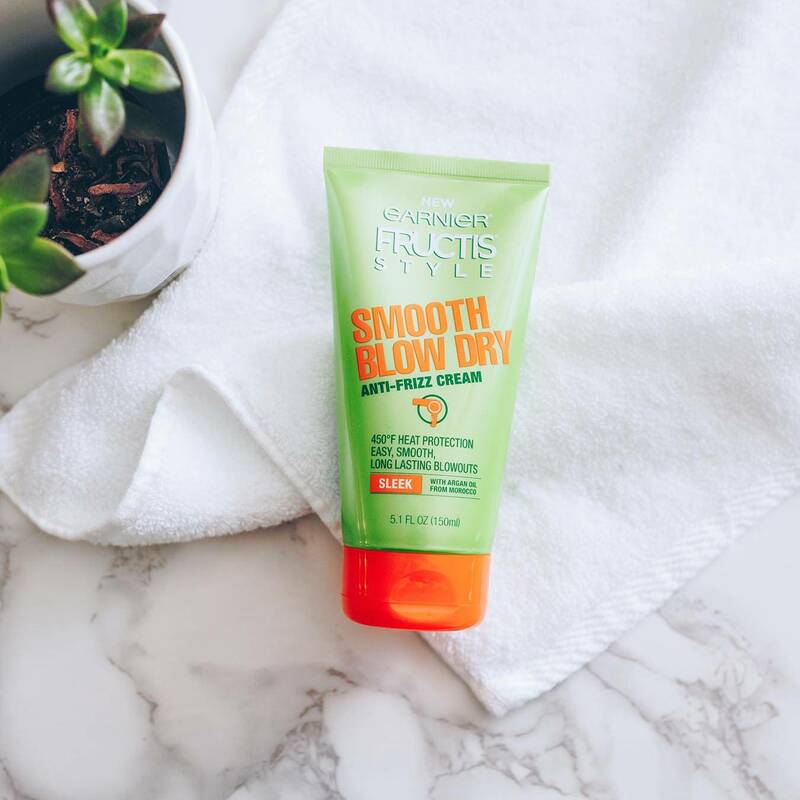 Our lightweight paraben-free formula, with fairly & sustainably sourced Argan Oil from Morocco, helps achieve easy blowouts. No pulling, no tugging. Tames frizz for smooth & shiny results that lasts for 24 hours. Protects against heat damage. For a Sleek Blowout, use a paddle brush for a smooth, sleek look. Blow-dry hair in sections positioning nozzle downward as you brush your hair down. For a Bouncy Blowout, use a round brush for added body. Wrap hair around brush and blow dry by positioning nozzle downward as you slowly unwind hair. For more looks, tips and fun visit our Style Hub. Apply a quarter-size amount evenly to towel-dried hair and blow dry. For thicker, coarse hair, add more product. Rated 5 out of 5 by Donna R from Absolutely love this!!! I use this on my hair daily to blow dry and flat iron. It is an awesome product and gives my fine, blonde hair a great smooth texture. I actually switched from a more expensive salon brand product when I found this one. PLEASE do not discontinue this product! Every time I find something I like, it gets discontinued. 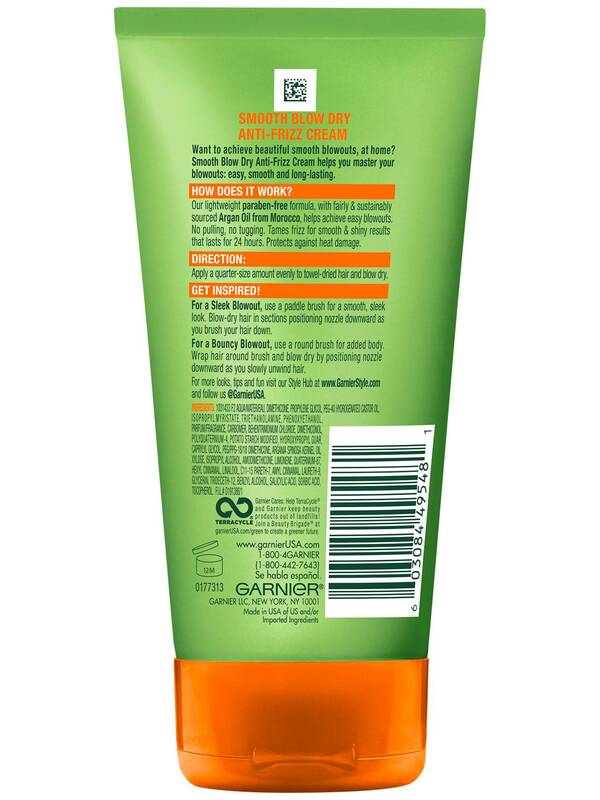 This particular Garnier product seems to be hard to find on shelves so that really scares me. This needs to be in better supply in the drug and grocery stores. If you discontinue this, I need to order a lifetime supply! Rated 5 out of 5 by MMH7 from Smooth and Protect at Awesome Price Point Panic ensues when this product is unavailable at my local Target store! I have come to rely on Smooth Blowdry Anti-frizz Cream to keep my hair protected from not just blowdrying, but also daily styling. Here is what I found and why I love this product: Non-sticky formula, does not leave residue on hair or hands (even when you accidentally squirt too much on!) Dries quickly Protects hair from all heat styling (<450deg) , not just blowdrying Extends time between hair trims Revives dry frizzy split ends when overdue for a hair cut Awesome price point especially with manufacturer coupons I think it works best when applied to wet strands from the ear down (where I struggle with the most frizz). I reapply to dry hair when I need a quick restyling with straightener or ends become frizzed and puffy (esp. pony tail). Rated 5 out of 5 by AJ D from Pretty Awesome! I'm a mom of 3 daughters and hair wash day, literally takes all day. Me and my daughters all have different hair types, but this product makes our hair wash day easier with each use. I love the way my hair feels and smells after applying & later blow drying it. I'm now a forever fan! Rated 5 out of 5 by ChristianOrtiz from Such a fan! This is my go-to morning hair product! Thanks to the smooth blow dry, I’ve cut my hair time down to 5 minutes! Rated 5 out of 5 by Shannonc115 from Less is more. Great product Clean and long lasting anti frizz product. Just don't over do it. Less is always more with anti frizz products. Rated 1 out of 5 by matilda from Did not work It did nothing to help my hair. I will not be using it again. Rated 1 out of 5 by anonymous2017 from Stop using drying ingredients! One of the main ingredients is propylene glycol, known to dry out hair. Why can't you guys use ingredients that are more moisturizing. Maybe thats why this is so cheap. If you have dyed hair stay clear of this. No protection at all because my hair was snapping as I was blow drying luckily nothing noticible but i threw it away.